Atomic Force Microscope image of a hydrogen bond. Image A. M. Sweetman et al. via Wikipedia Commons. Remember, these electronegativity values are just made up. They’re also an average, and it turns out C–H bonds vary wildly and aren’t represented well by averages: bond strengths alone vary by 30%. 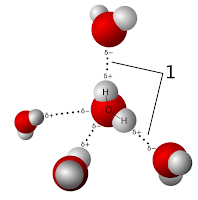 Some C–H bonds, it seems, are polar enough, and their hydrogens hydrogen bond to nearby oxygen atoms. 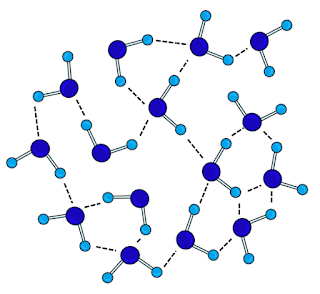 Interconnected water molecule network. Image ©TWDK. These rulebreaking hydrogens might not be directly attached to very electronegative atoms but, it turns out, they are seldom far away: usually the carbon they are on is playing gooseberry in between the hydrogen and an electronegative atom which pulls electrons away across the carbon in a tug of war. Chemists call such a carbon activated, and the hydrogen acidic. There is already a lot of mystery about the nature of the hydrogen bond. Why is it so much stronger than other polar bonds? How do we identify it? But the discovery of hydrogen bonding from hydrogens on carbon atoms, has thrown bonding classification into a crisis. This isn’t the first time this has happened either. The hydrogen bond, first described in 1939 by Pauling of the Pauling electronegativity scale, has since had its definition broadened and changed. In 1957, a paper called “The Hydrogen Bond” critically reviewed the evidence for hydrogen bonding, and attempted to explain it. Scientists are still trying. Carbon-based hydrogen bonds, described as a special kinds of weak hydrogen bonds, have now been observed in lots of biomolecules including amino acids, proteins, sugars, and DNA. How do we identify a hydrogen bond? And why does it matter? 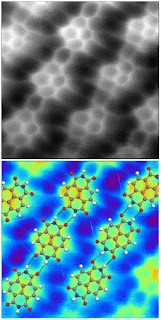 If we’ve missed carbon-based hydrogen bonds, there are probably lots of other intermolecular interactions we’ve missed, and which could be used to explain the structure and solubility of biomolecules, the way that proteins fold, how the body recognises molecules, methyl group, and answer unresolved questions about “weird” interactions seen in biology. 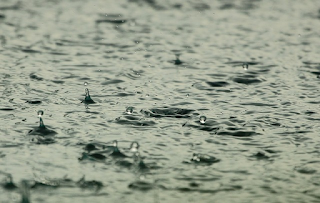 Water is liquid by hydrogen bonding. Image diego_torres via Pixabay. 1. 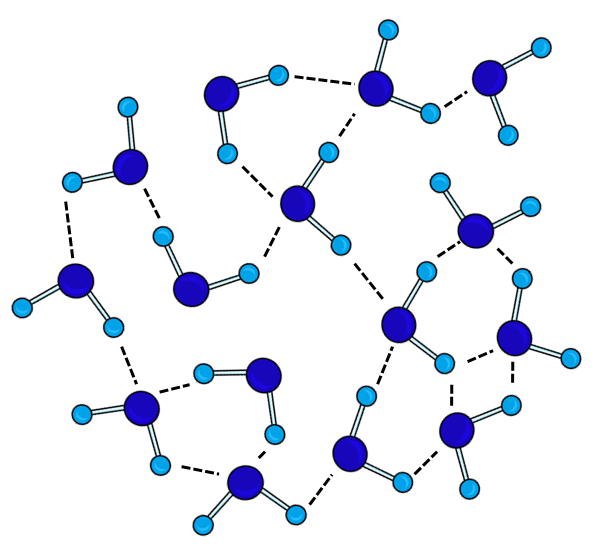 Hitherto, hydrogen bonding has been singled out because of its unique strength, but hydrogen bonds strengths range from 4 to 50 kJ mol-1, and carbon-based hydrogen bonds are weaker than conventional hydrogen bonds, implying some sort of continuum wherein bond classification gets messy and awkward. When is a weak hydrogen bond just a hydrogen-containing polar bond? 2. 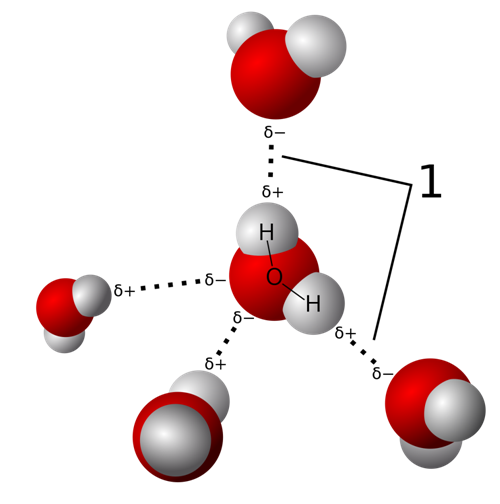 Bond length has also been used to classify hydrogen bonding: a C–H···O interaction counts as a hydrogen bond when the H···O separation is less than 3.2 Å, or the sum of the atoms’ radii (meaning they must overlap). The problem with this is that bond strength and length are basically the same thing, so we still have the continuum problem. 3. Others have mentioned that bond angle is important. In some interactions, like a classic hydrogen bond, atoms overlap linearly, or face on (180o), whilst in other structures the atoms are forced to overlap at an angle to avoid bumping into other bits of molecule. The C–H···O bond angle has nominally been suggested to fall within 90-180o, but not only have a huge number of different hydrogen geometries already been observed, but this is actually a pretty enormous range anyway. The C–H···O bond angle has nominally been suggested to fall within 90-180 degrees. Image ©TWDK. 4. Hydrogen bonds leave spectroscopic signatures. Nuclear magnetic resonance spectroscopy (NMR) can pick up hydrogen bonds as a downfield [left] chemical shift in a hydrogen NMR spectrum, whilst infrared spectroscopy (IR) detects a decrease in wavenumber, characteristic of the C–H bond lengthening and weakening as the hydrogen is tugged off to do some other bonding elsewhere. But whilst a downfield chemical shift is seen for NMR in carbon-based hydrogen bonding, something different is seen for IR: an increase in wavenumber, or sign of C–H bond shortening and strengthening. Which is right? Is it a hydrogen bond, or isn’t it? And what’s happening to the C–H bond? 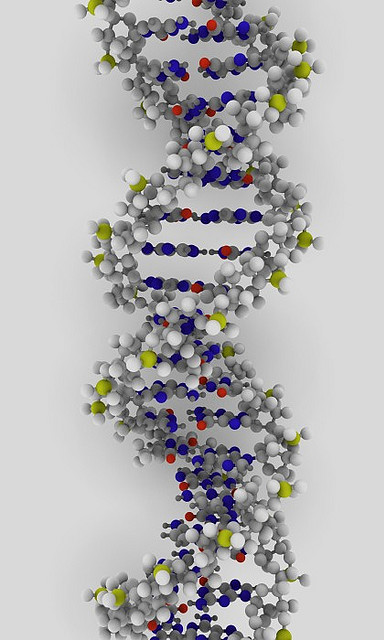 DNA. Image ©ynse (CC BY-SA 2.0). We still don’t know enough about carbon-based hydrogen bonds to predict them – they just pop up here and there unexpectedly. For example, the base pair thymine and cytosine form C–H···O hydrogen bonds, but apparently the thymine methyl group is the most frequent supplier of the hydrogens that do this, even though it’s not very activated and there are better options available. Scientists aren’t even sure whether what the base pairs do counts as bona fide hydrogen bonding and, as such, our understanding of the structure of DNA is in turmoil. 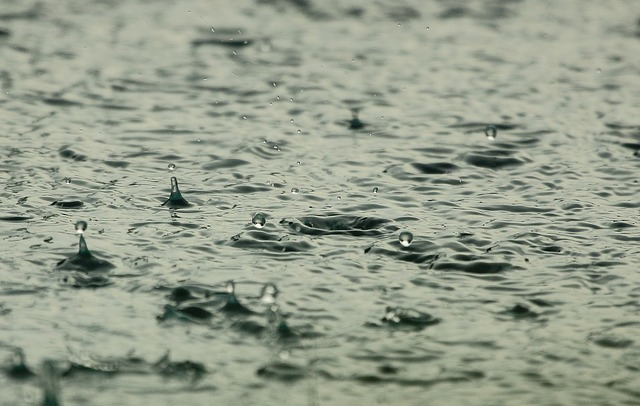 To make things even weirder, other kinds of hydrogen bonds have also been noticed too – including carbon-based hydrogen bonding to nitrogen (which, you’ll remember, is less electronegative than oxygen), and even sulfur (which, at 2.6, is almost as pathetic as carbon! 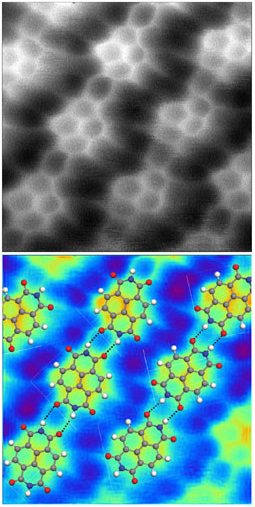 ), and, even weirder, hydrogen bonding onto carbon atoms in O-H···C and N-H···C interactions. These discoveries could be just the beginning of a whole new field of molecular interplay. Bond Energies. Organic Chemistry, Michigan State University. Steiner, Thomas. The hydrogen bond in the solid state. Angewandte Chemie International Edition 41.1 (2002): 48-76. Smith, Douglas A. A brief history of the hydrogen bond. ACS Symposium Series. Vol. 569. Washington, DC: American Chemical Society, , 1994. Horowitz, Scott, and Raymond C. Trievel. Carbon-oxygen hydrogen bonding in biological structure and function. Journal of Biological Chemistry (2012): jbc-R112. Desiraju, GautamáR. Distinction between the weak hydrogen bond and the van der Waals interaction. Chemical Communications 8 (1998): 891-892. Westler, William M., et al. Hyperfine-Shifted 13C Resonance Assignments in an Iron− Sulfur Protein with Quantum Chemical Verification: Aliphatic C− H··· S 3-Center− 4-Electron Interactions. Journal of the American Chemical Society 133.5 (2011): 1310-1316.